The Land of Enlightened Wisdom students gathered to celebrate the saint and scholar Lama Tsongkapha on his accomplishments and numerous texts written in his lifetime. 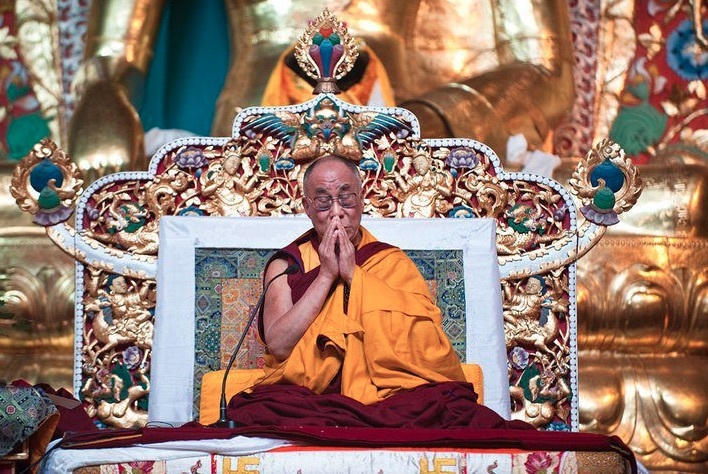 The live teachings of HH Dalai Lama will be on Lama Tsongkhapa's Lamrim Chenmo during 11/29/12 - 12/13/12 7:00 - 7:30pm(PST) and 11:30pm(PST). 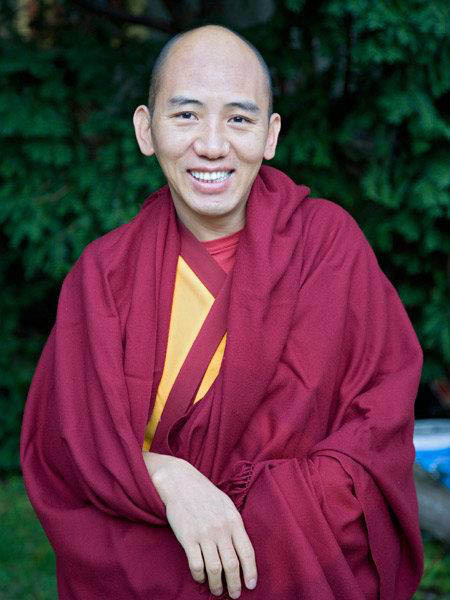 Venerable Yeshi Dorjee, an accomplished teacher, introduced students with his gentle style and his extensive knowledge to basic concepts of Tibetan meditation. The subject of Calm Abiding and Analytical Meditation is based on the Great Path to Enlightenment written by Lama Tsongkhapa in the 13th century. 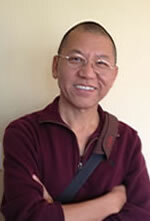 The Tibetan Art Workshop will be taught by Venerable Yeshi Dorjee. Students will learn to draw the Five Buddha's hand gestures and different flowers in sacred art. This workshop is a unique opportunity to study with Yeshi. He is a two time Smithsonian Museum celebrated artist, he shares with us his art as a Meditation Practice. His light hearted humor and easy going style is rich with the wisdom of playful innocence, joy and laughter! In Praise of Dependent Origination by Lama Tsongkapha will be chanted in English and Tibetan, lead by Ven. Yeshi Dorjee. Lha-Bab Duchen marks the anniversary of the Buddha’s descent from the heavenly realm to the earth. 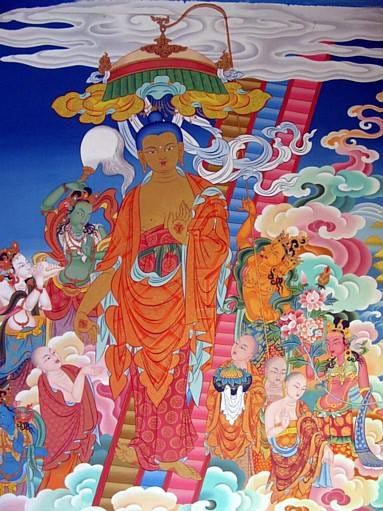 It is on this day that Buddha Shakyamuni descended to The Heaven of Thirty-Three in order to give teachings to benefit the gods in the desire realms. 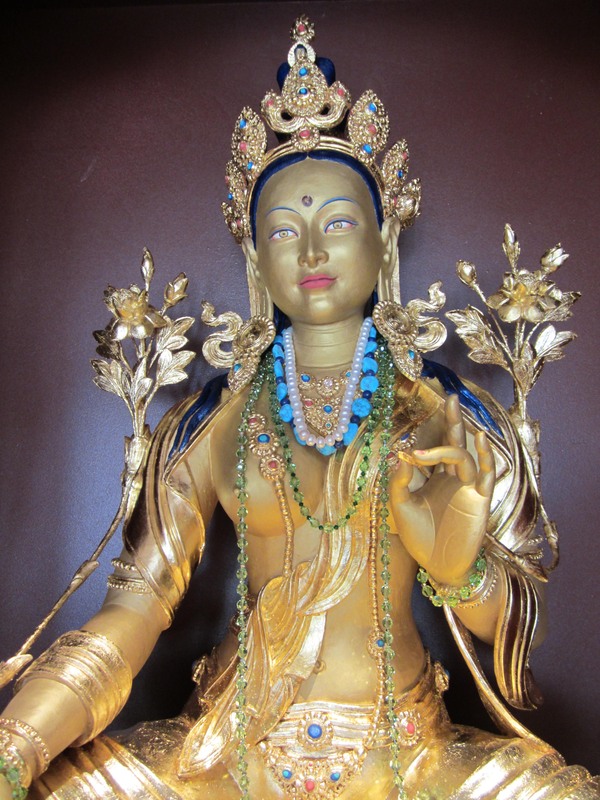 Buddha wanted to repay the kindness of his mother by liberating her from Samsara. Maya, the Buddha's mother, was reborn after her death in the realm of the thirty-three gods. 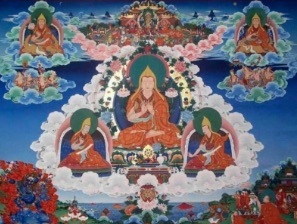 It is taught throughout the Buddha's teachings and their commentaries that the effects of virtue and wrongdoing are billions of times more powerful on the four great occasions connected with the Buddha's life. 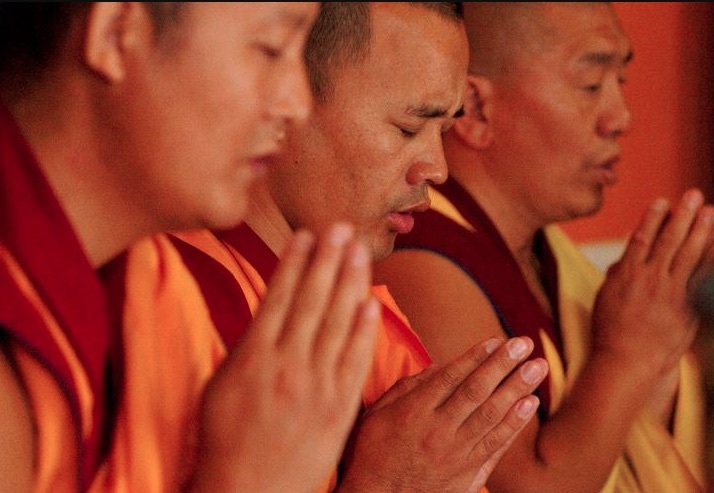 It is part of the Tibetan Buddhist tradition to engage in virtuous activities and prayer on this day. The Tsawa Monks are a group from Gaden Jangtse Monastery in south India, who have been touring the USA to raise awareness about Tibetan Buddhism and culture. The Gajang Tsawa monks have concluded their 2011-12 World Peace Cultural Tour. Tibetan Artist, Yeshi Dorjee demonstrated the traditional techniques of creating a butter flower. Using large bowls of cold water to cool off warm fingers and butter mixture, students practiced on how to work with the butter mixture. Creating beautiful designs on picture frames, students were able to take them home to place of their altars. "Having developed enhusiasm in this way, I should place my mind in concentration; For the person whose mind is distracted, Dwells between the fangs of disturbing conceptions." 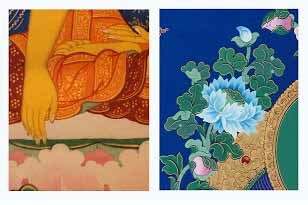 In the whole ot the Tibetan Buddhist tradition there is no single treatise more deeply revered or widely practiced that A Guide to the Bodhisattva's Way of Life. This great work was compoased by Shantideva, an eigth century uddhist masterat the monastery of Nalanda in northern India. Text: A Guide to Bodhisattva's Way of Life by Santideva translated by Stephen Batchelor, Library of Tibetan Works and Archieves. It can be ordered from Amazon. Land of Enlightened Wisdom monks and students offered a Guru Puja and 21 Praises to Tara for the Long Life for His Holiness the Dalai Lama on His 77th Birthday. Saka Dawa is one of the most important sacred Buddhist days. 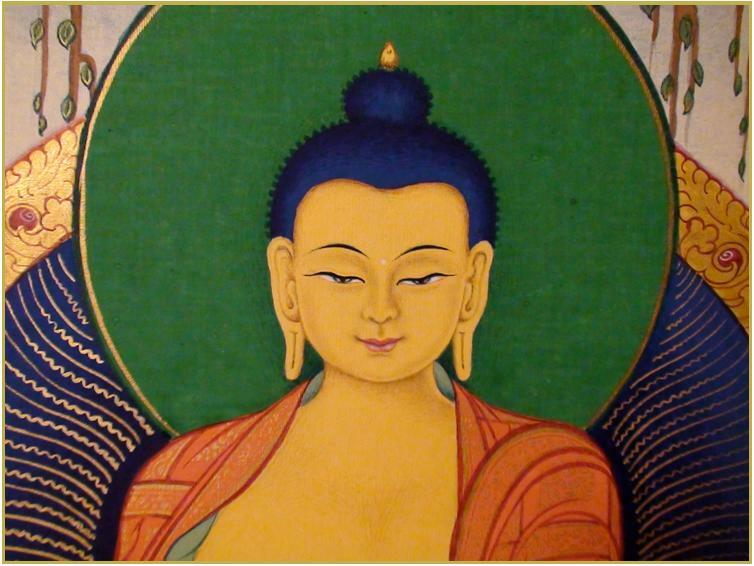 Saka Dawa is the day of Buddha's birth, enlightenment and parinirvana. The whole fourth Tibetan month, usually May or June is celebrated. On the full moon day of this month, Buddha had performed three most important deeds, he was born, attained enlightenment and parinnivana. During this month people place special emphasis on dharma practice like circumambulation of Monasteries and Stupa, prostrations, taking precepts, reciting mantras, offering mandalas, doing sadhanas and saving animals lives. All the merits will be multiplied 100,000 times from our dharma practices. EVENTS: JUNE 3, 2012 9:30am Fish Liberation - JUNE 4, 2012 10:30am Guru Puja. 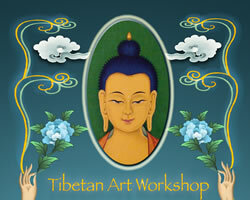 The Tibetan Art Workshop is a unique opportunity to study with respected Artist Yeshi. 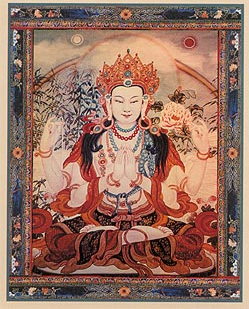 Students will learn to draw the deity using techniques designed by Yeshi Dorjee. He shares with us his art as a Meditation Practice. His light hearted humor and easy going style is rich with the wisdom of playful innocence, joy and laughter! The guest teacher, Venerable Tenzin Thutop, has been teaching the Tibetan language to Westerners, at every level, since 1999. In this beginning class, no prior experience is required. Students will learn the written and spoken forms of the alphabet and basic grammar. Lessons will be learned through drills and conversational skills practice with class handouts provided by the teacher. No class book is needed for this class. This is a 8 weeks class for $150.00.